i’m not a celebrity, get me in there! 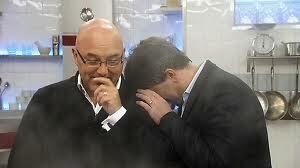 So, we’re at the end of week two in the Celebrity Masterchef kitchen and I’m thoroughly enjoying it. I decided against the previous series – for some reason the fact that it was relegated to BBC1 lunchtime really put me off. Having said that, 18:30 isn’t much better and I ‘series record’ it but, y’know, I couldn’t be arsed. Seeing snippets of it on Saturday Kitchen each week has convinced me that I made the right choice. Agent: Hi Emma. 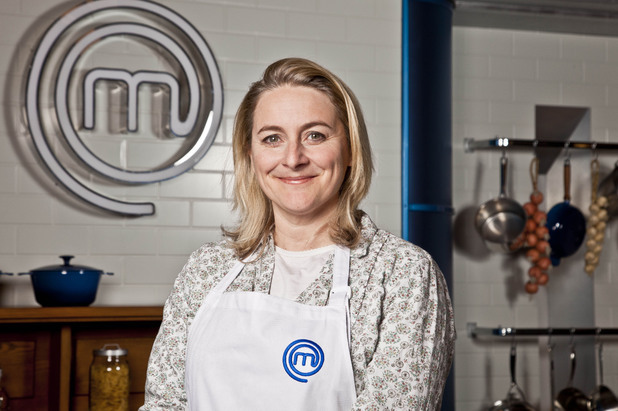 So, the BBC got in touch and we discussed the possibility of you taking part in this years Celebrity Masterchef. You’re a big fan, right? Are you free for the next few weeks? Agent: … I’ll take that as a ‘yes’ then. Having been billed as a MC aficionado Emma made, as Gregg would say, a school boy error. The final task of the week was the critics round – two courses for previous CMC contestants to sample. It seems that Lisa Faulkner might get to attend all of these, lucky girl. Or maybe not. Sadly, the duck was over done and not properly rested but the beans were a hit and the pudding delightful. It was enough to join Leila, Jamie and Javine in the next round. So, I’ve started to compile a mental list of dishes I would cook should my day in the MC kitchen ever arrive. There are a couple of things while not ‘out there’, I don’t think I’ve seen done before but I’ve also taken note from Masterchef Australia. There was a round where the cooks had free rein of the larder to create a two course menu. The look of horror as they looked on at tables full of tinned vegetables and fruit along with frozen products was fabulous. Have John and Gregg ever given the UK contestants a similar task? I’m thinking not. I would love to see the look of horror on their faces as I go wild with a tin opener and attempt a fiiiine diiiining menu. Sad George Layton had to go, I liked how completely unruffledly indifferent he was to the urging of JT and GW to “PLATE UP NOW!” Greg was then offended that his Weinerschnitzel was undercooked, but two of the judges outside actually got overcooked ones — obv Layton was the correct loser but it was odd that he was kicked out for “raw” veal, rather than the more accurate “wildly variable veal”. I guess the opinions of the judges outside aren’t taken into account. I loved Gregg’s ‘YOU’VE GOT TO GET YOUR SCHNITZEL UP!” Yes, George was great & FINALLY someone who realises that being a whole 5 minutes late for a bunch of critics doesn’t matter! In a professional kitchen when you’re working with other chefs yes, but a few minutes won’t actually kill anyone. BTW, we totally have to go to Cafe Namaste – it looked fab. Extremely sad that tonight is the final episode! I’m going to go out on a limb and say that it’s going to be very close. Full posting will follow the grande finale!